If you read our blog last month, you’ll know that Golden State Laundry Systems is on a mission to build The First Laundromat on Mars. We have been inspired by our California neighbors at SpaceX and their plan to, one day, build a Martian city. And of course, every city needs a laundromat. If every city needs a laundromat, every laundromat needs top quality commercial washing machines. And the crew at Golden State Laundry Systems mission control has been deciding which commercial washer will be the first installed in our laundromat on Mars. The Electrolux 450 G is simply the best commercial washer around. 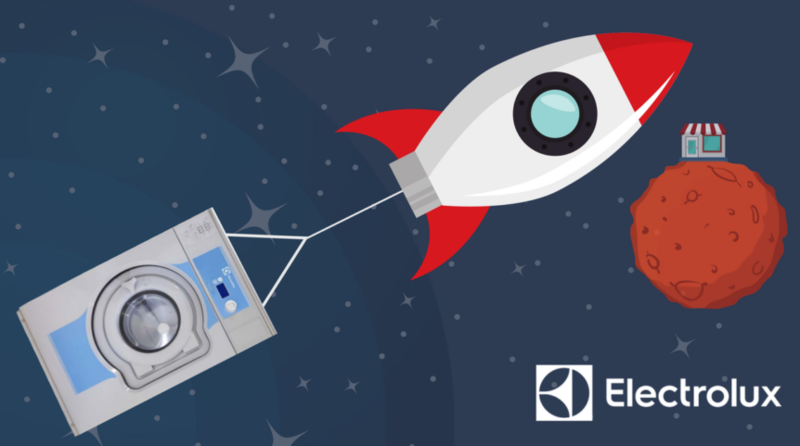 In truth, the full range of Electrolux high G-Force washers are game changers, with the power to seriously boost a laundromat’s profitability or an in-house laundry’s efficiency. But we chose the 450 G-Force for its extra speed and its soft mount design that means it can be installed almost anywhere. Reasons To Love The Electrolux H-Series Washer? If you read last week’s post, you’ll know that our laundromat would need to serve a full city on its own, and before our second rocket arrives, we’ll only have one washer. The H-Series washer’s high spin means that clothes need barely any time in the dryer — these time savings will help us serve a lot of customers. This speed will benefit your laundry business too. Laundromats can serve more customers at peak times and in-house laundries can vastly increase volume compared with regular commercial washers. Plus, less time in the dryer means major savings on energy bills! Water will be scarce up there, so our Martian Laundromat will need to be water-efficient. Thankfully our washer comes with Auto Savings — an exclusive Electrolux technology that saves up to 50% water every wash.
What does this means for your laundry business? Fresh water is a precious commodity on Earth too, and water bills keep on rising. By choosing Electrolux washers, your business can dramatically cut utility bills while being environmentally responsible. Electrolux’s soft mount design makes for easier and more flexible installation. That’s a big deal for our laundromat on Mars — because who knows what kind of surface we’ll need to install the washer on? Maybe it would even be okay on rocky red dust — we’ll need to check that! Why easy installation should matter to you? Electrolux soft mount washers will lower installation and construction costs for laundromats and they provide huge flexibility for on-premises laundries in hospitals, hotels and other businesses. Soft mount washers can be installed where other washers can’t — wood floors and upper levels. Compass Pro has lots of great features but one of the most useful for our laundromat is its multi-language display which allows you to choose from a number of languages and display two at once. Our laundromat will serve space crews from all over the world so this feature will come in handy. At Golden State Laundry Systems, we’re proud of California’s mix of cultures and languages. Compass Pro’s multi-language feature allows everyone to comfortably use your equipment.